Heat oil in large skillet on medium-high heat. Add onions; cook and stir 2 min. Add beans, corn, tomatoes and seasonings; mix well. Cook 3 min., stirring frequently. Top tortillas with bean mixture, cheese and cilantro. 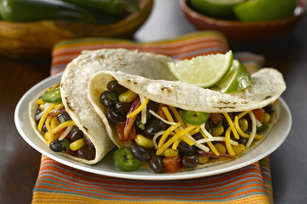 Look for corn tortillas in the freezer section of your grocery store. If you cannot find them, you can use small flour tortillas instead. Serve topped with sliced jalapeño peppers, your favourite salsa and/or sour cream. Cook tortillas, 1 at a time, in skillet on medium-low heat 1 min. on each side or just until warmed.